Think you know your tunes? Are you a movie buff? Into television shows? Top Chef fan? 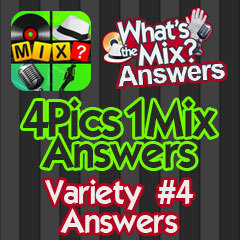 4 Pics 1 Mix Answers is your safety net for when the hit game throws you for a loop. 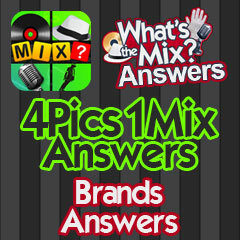 Companies, Places, Food, Television, Bands, Movies and Songs are all fair game in this mashup mobile app. 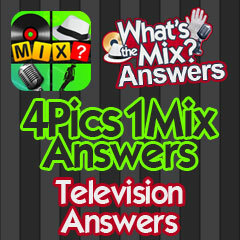 Test your intellectual prowess and see if you can beat all the levels of 4 Pics 1 Mix. 4 Pics 1 Mix is also called What's The Mix and we've got answers for every level. To find the level you are looking for, just use the menu to jump to the category you're on: Variety #1, Variety #2, Variety #3, Variety #4, Foods, Bands, Movies, Songs. Each category has 25 levels. Navigate to the thumbnail and we'll give you the answer to that level. 4 Pics 1 Mix Answers | 4 Pics 1 Mix Cheat This site is not endorsed by or affiliated with Candywriter.